Besides being easy-to-grow in the garden, mustard greens are very healthy. When cooked properly, they are tender and flavorful. Mustard greens are a cruciferous vegetable with sulfa compounds and a strong flavor, perhaps leading to it’s less than favorite rating. But this vegetable is full of health benefits — high in antioxidants and other phytonutrients such as phenols and Isothiocyanates (ITCs) which reduce oxidative stress in the body and help protect against chronic age-related diseases and some types of cancers. Plus, mustard greens are excellent sources vitamin K, vitamin A, calcium, vitamin E, and iron and good sources of many other vitamins and minerals. We all need this vegetable! 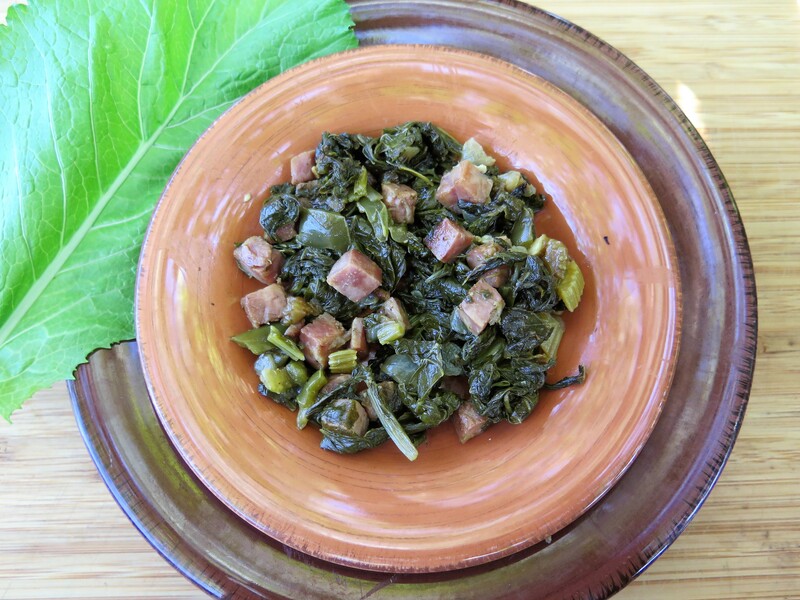 Mustard greens is one of the easiest vegetables to grow in an autumn garden in Louisiana. Last year, I sowed a packet of seeds — they all came up and grew! More than I could ever use. This year I a purchased just a few small plants. 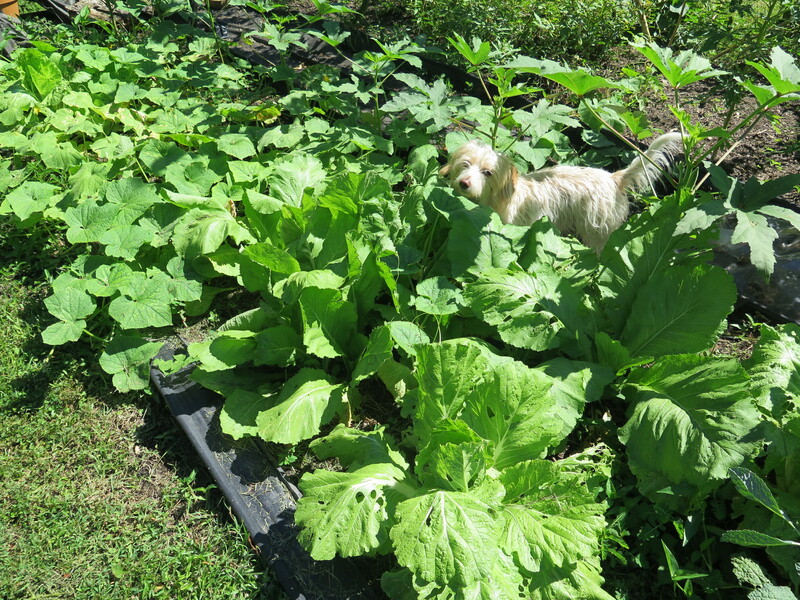 Here’s my garden in October with mustard greens, okra and cucumbers. My little dachshund follows me around, here she finds something interesting to sniff. I harvested my crop of four plants to make this dish. As a bonus after cutting the leaves, the mustard green plants will sprout up again making another tasty dinner dish in a couple of weeks. This is about 1-1/2 lb mustard greens. This is an easy one-pot recipe. 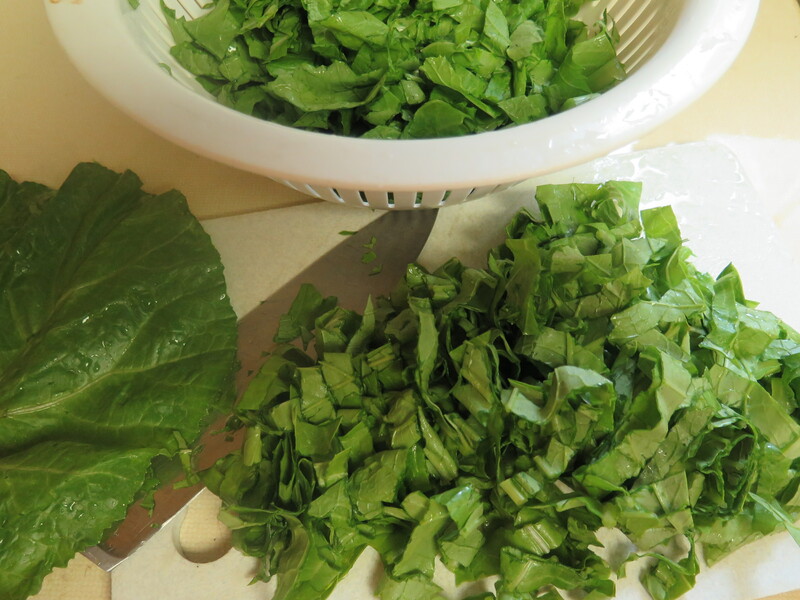 Carefully wash the greens, remove the center stem and cut into small pieces. Chop the seasoning vegetables — onion, bell pepper, celery and garlic. Saute the seasonings until tender. Add the ham to sear it and Tony Chachere’s seasoning. Then add the chopped greens and simmer. 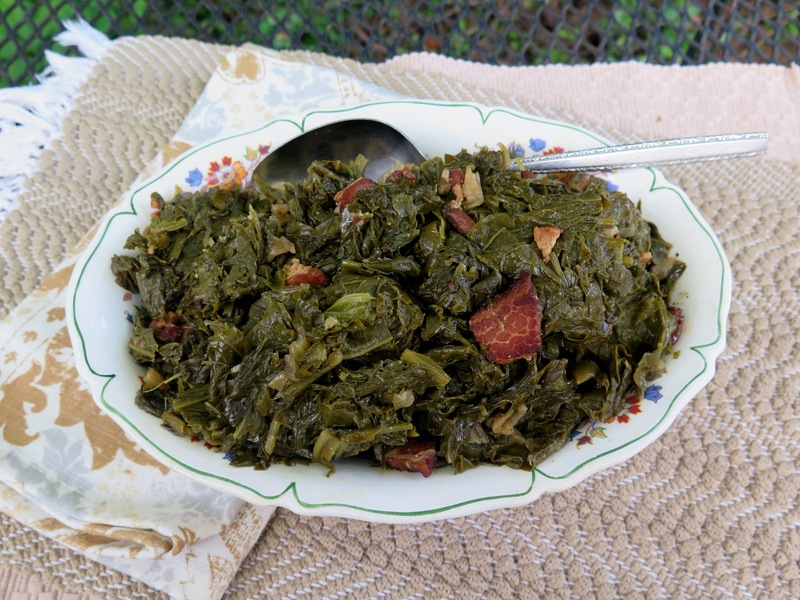 The recipe calls for a pound of trimmed mustard greens, finely chopped. This might seem like a lot but the greens do cook down quickly. 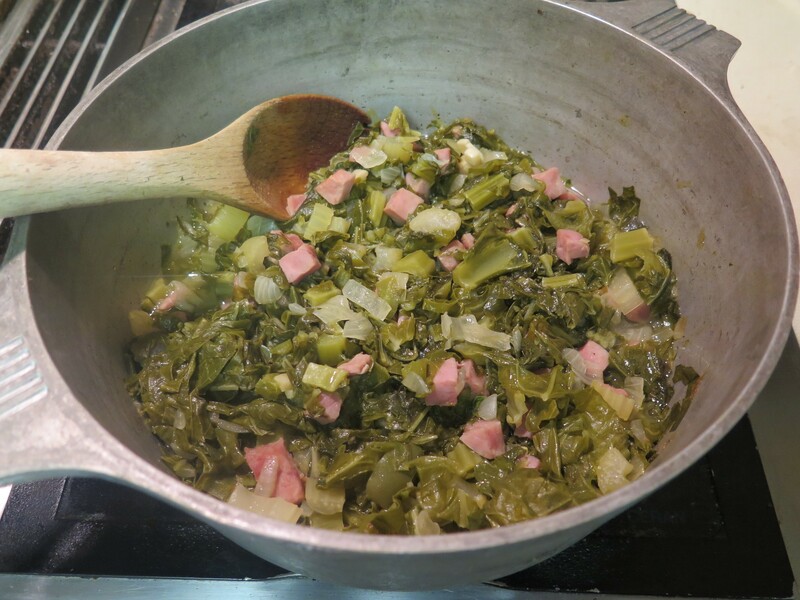 Add a few greens at at time and stir to mix in with the sauteed vegetables and ham. Continue until all the greens are added. Cover the pot tightly with a lid — add water only if the greens get too dry and let the greens simmer on the stove for an hour. You really don’t need to add salt to this dish if you’ve used ham for seasoning — plenty of salt here. While the greens cook, find something else to do — fix the rest of the meal — watch the news on T.V. Check the greens from time to time. Then the greens are done. Think that you are eating like a Louisiana native when you devour this dish. Although the recipe should serve four people, my husband and I could easily have eaten the entire dish! 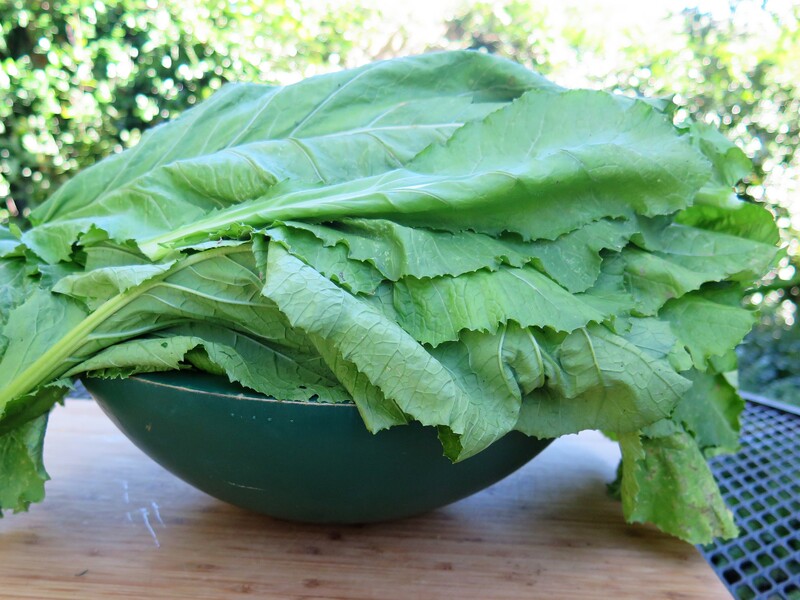 Carefully wash and sort the mustard greens, trim any bad leaves and remove center stem. Drain. Then chop into small pieces. Set aside. In a large heavy pot or cast iron pot on medium heat, add the vegetable oil, onion, celery, bell pepper. Saute 10 minutes until the vegetables are soft and onion is translucent. Add the garlic and saute another 2 minutes. Add the diced ham and Tony Chachere’s Creole Seasoning (optional) and stir for 2-3 minutes until the ham is seared. Reduce heat to low. 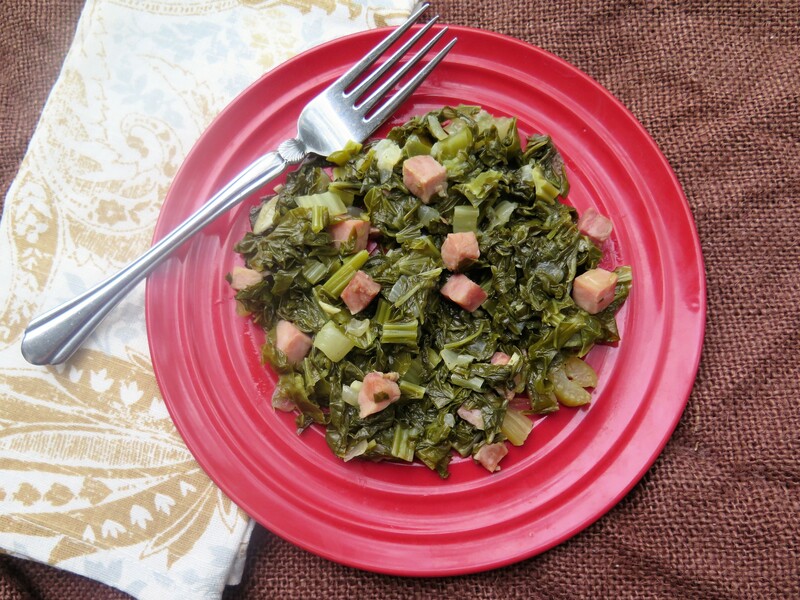 Add mustard greens in small batches, stirring to mix the greens with the seasonings. As the greens cook down and reduce in volume, add additional batches of greens until all are added. 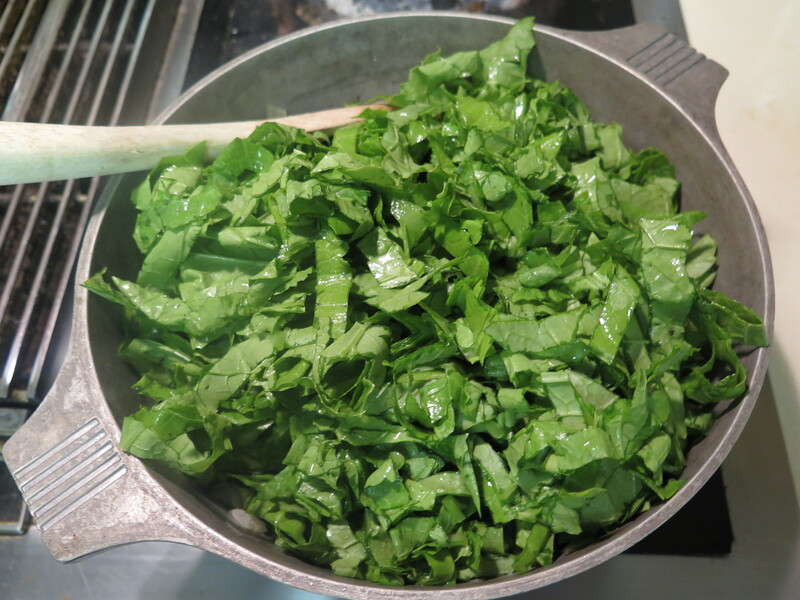 Cover tightly with a lid and adjust heat — increasing slightly — until greens come to a gentle boil. Then reduce heat again to low and let the greens simmer on the stove, for an hour. Check occasionally, stir and add 1/2 cup of water if greens become too dry. When ready to serve, taste the greens. Add salt, only if needed, and black pepper to taste (up to 1/4 tsp pepper). Pass vinegar, optional, at table. 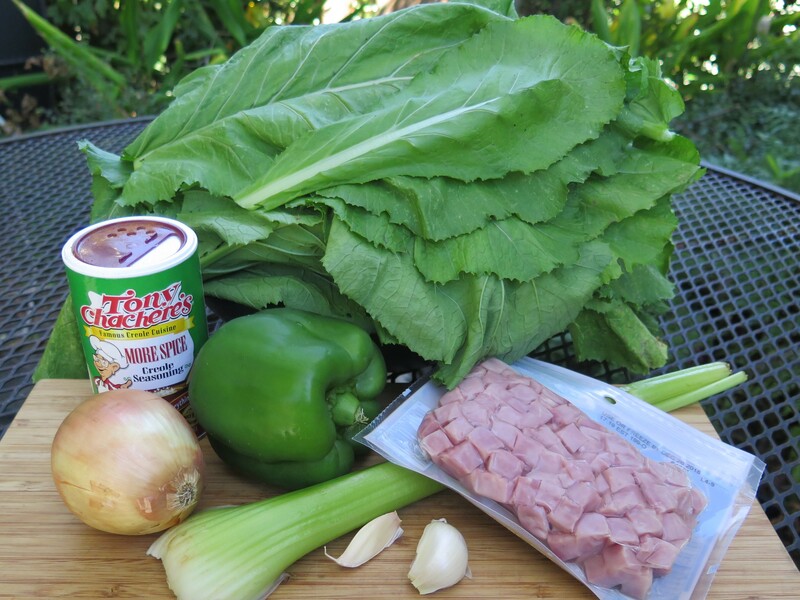 This entry was posted in Louisiana garden, Recipes and tagged healthy vegetable, Louisiana garden, smothered mustard greens by Maylee at Beyond Gumbo. Bookmark the permalink.